The best selling tour of Africa for more than 20 years! The tour from Cape Town to Victoria Falls has been the most popular tour in Africa for years – and for good reason! The international group tour starts in Cape Town, South Africa and continues up the East coast through Namibia. 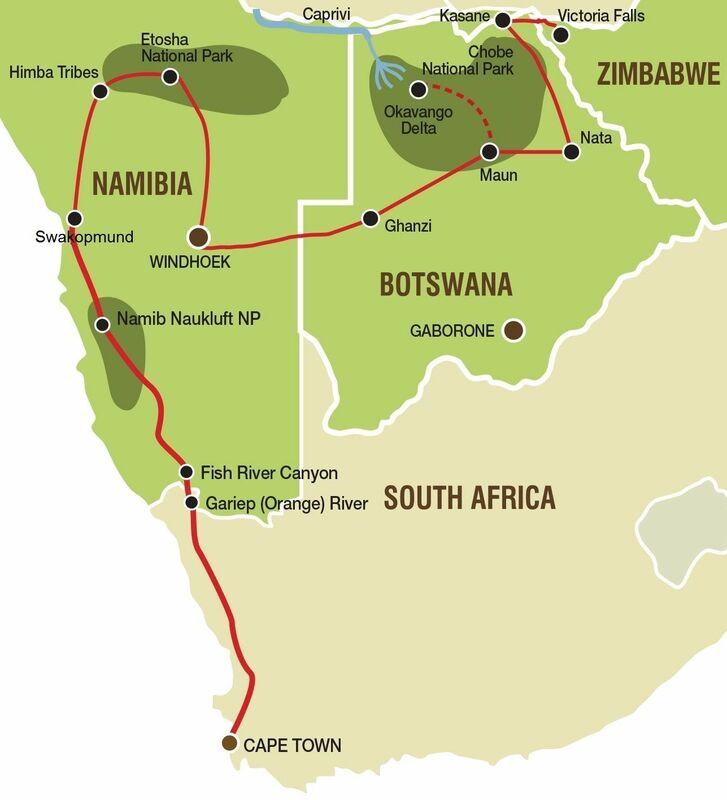 In Namibia we visit the Namib desert, Dune 45, Sossusvlei, Etosha National Park and many more highlights before we continue onward to Botswana for the Okavango Delta and Chobe National Park, before reaching one of the 7 natural wonders of the world - Victoria Falls in Zimbabwe! We start our Cape Town to Victoria Falls camping tour as we make our first stop at Table View for some photos of Table Mountain from across Table Bay. The Cederberg region not only boasts spectacular mountains and orange farms, but it is also the home of the Rooibos bush and today we will visit a working Rooibos tea farm and see the plants of Rooibos and Buchu that occur naturally in the wild. Indigenous to the mountain slopes of the Cederberg, this herbal beverage has earned an international reputation as a healthy and refreshing alternative to regular tea. A dinner at our overnight stop offers an opportunity for us to get acquainted while enjoying some South African hospitality.